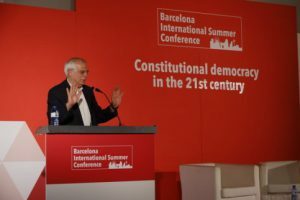 Spain’s Foreign Minister, Josep Borrell, is to launch a high court challenge against the Catalan government’s decision to reopen its offices abroad that were closed during the recent period of direct rule from Madrid, after article 155 was applied. Josep Borrell, Spain’s Foreign Minister, during an event hosted by Societat Civil Catalana unionist group, on 14 July 2018. The Spanish executive justifies the appeal in Catalonia’s high court on the basis that the government has not followed the administrative procedures required by law. The law says that regions must formally communicate their intention to open representative offices and receive authorisation from Madrid. Yet, as the offices in question already existed and were to be reopened after their closure under direct rule, the Catalan government decided that informing the central authorities was unnecessary. The foreign ministry insists that it has given the Catalan government time to ‘rectify’ and comply with the ‘established procedure’ but after delegates were reappointed to the offices in July, it has decided to go ahead with the legal challenge. At the same time, the ministry says that the challenge does not deny the Catalan government’s right to open such offices.